Time for some images. I keep writing on equipment and technology so much that I tend to neglect posts which actually contain images shot with the oh-so-wonderful photographic equipment. 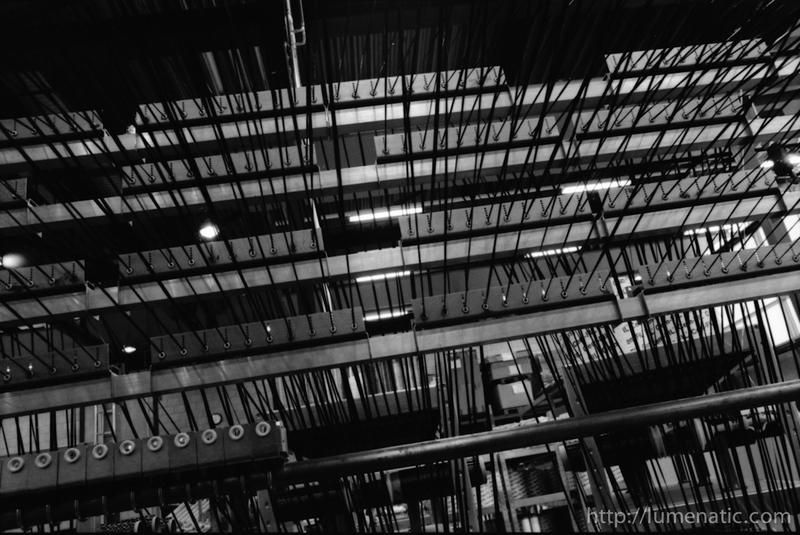 A few months ago I did a shooting session in the machine halls of the institute where I work. I mainly shot analog there with my Zenza Bronica ETRS middle format camera. Today I want to share these images and comment on them a little. 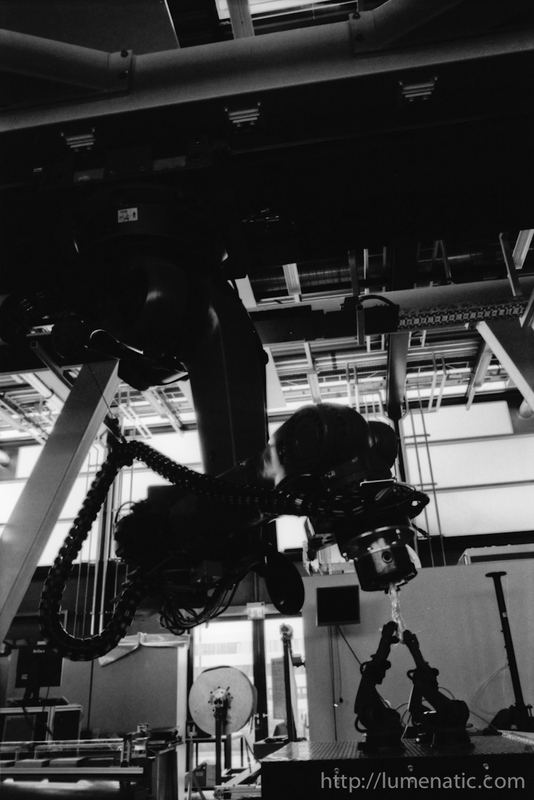 This is an industrial robot used in a so-called Preform Center. 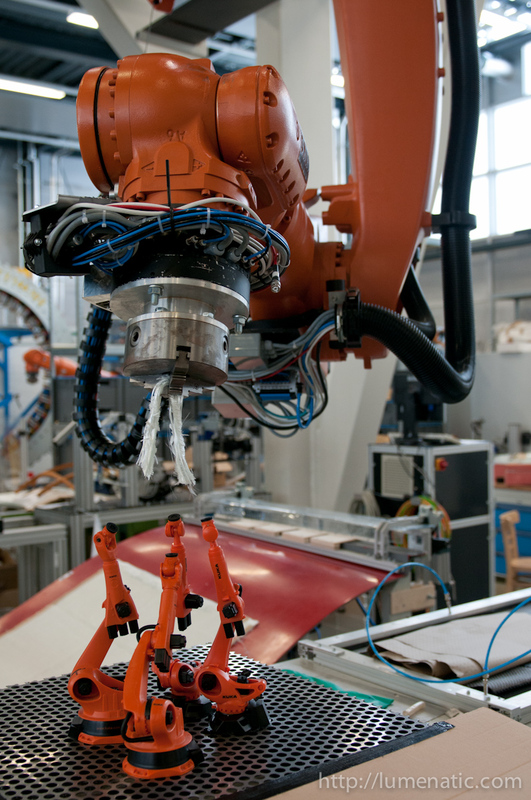 In a Preform Center, fabrics made of reinforcement fibres are cut and subsequently handled by the big robot. Preforms are dry textiles, e.g. from carbon or glass fibres, which are draped into a specific form and then infused with a polymeric resin to form the fibre-reinforced part. 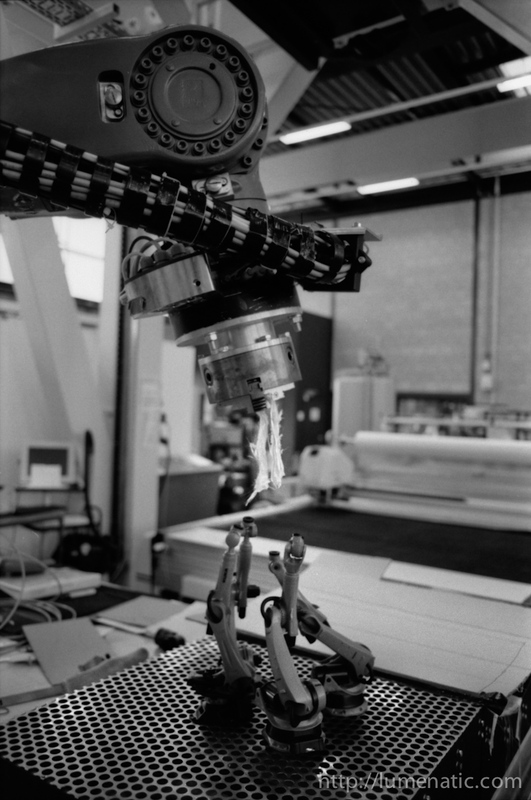 The robot can attach different heads to manipulate the textiles: He can grab them, glue, sew, inspect and drape. 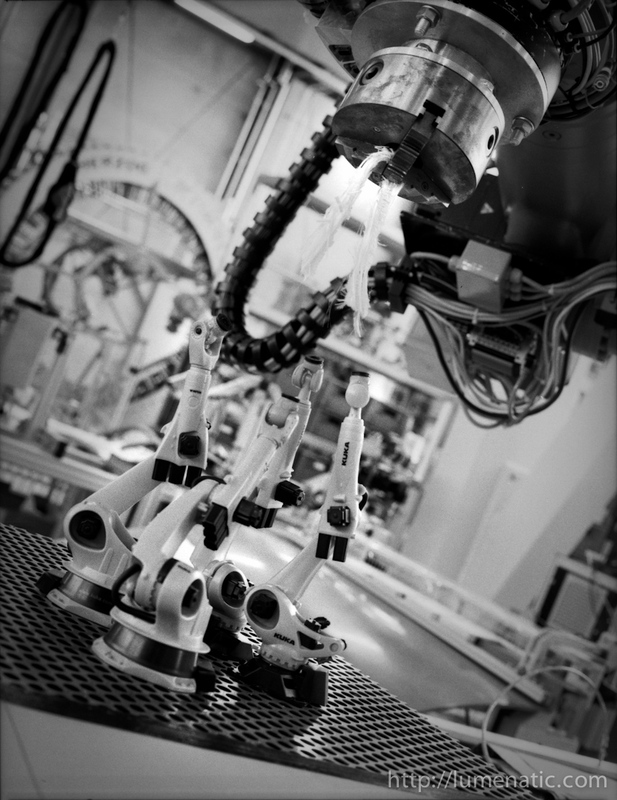 The small robots are models. I wanted to recreate the impression of a bird feeding its young. Another angle of this scene, also shot digital. 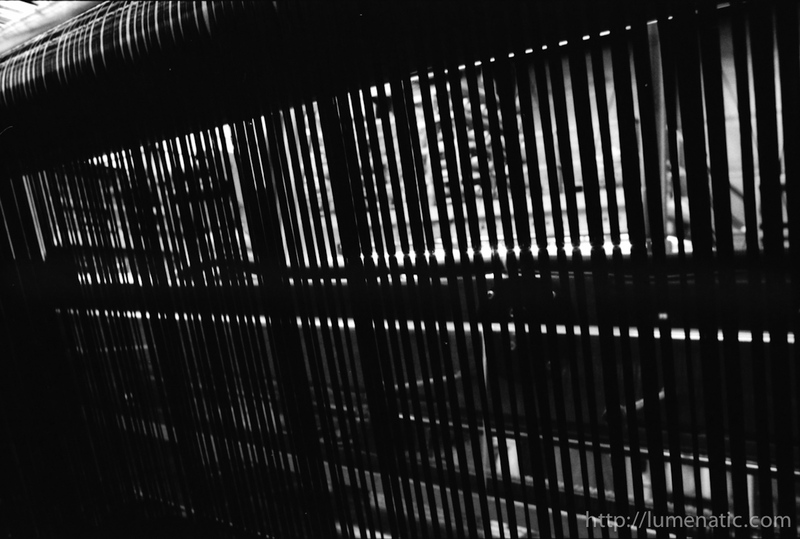 The following images were all shot on film using the Zenza Bronica ETRS middle format camera. Yarn tension control elements on a circular knitting machine (on such machines the bodies of T-Shirts are knitted for example). 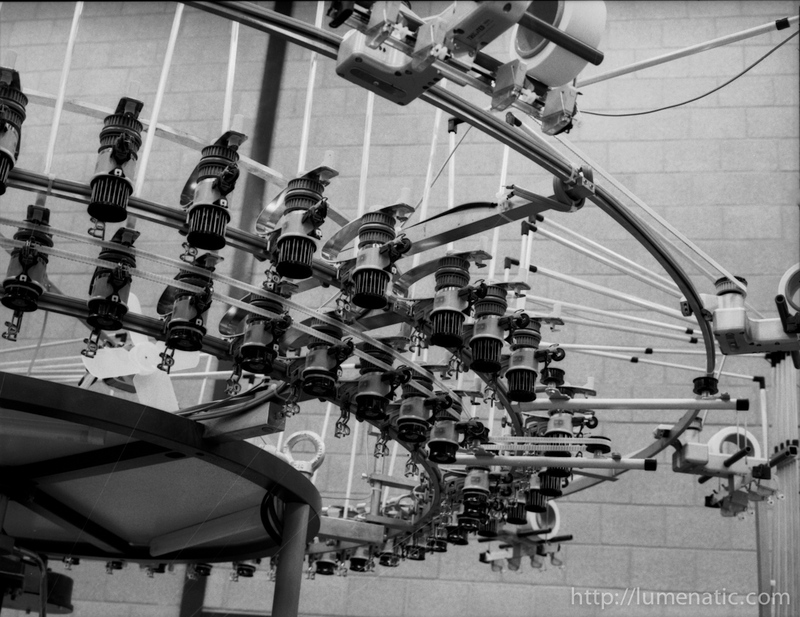 Another angle on the circular knitting machine. Non-crimp fabric laying head. 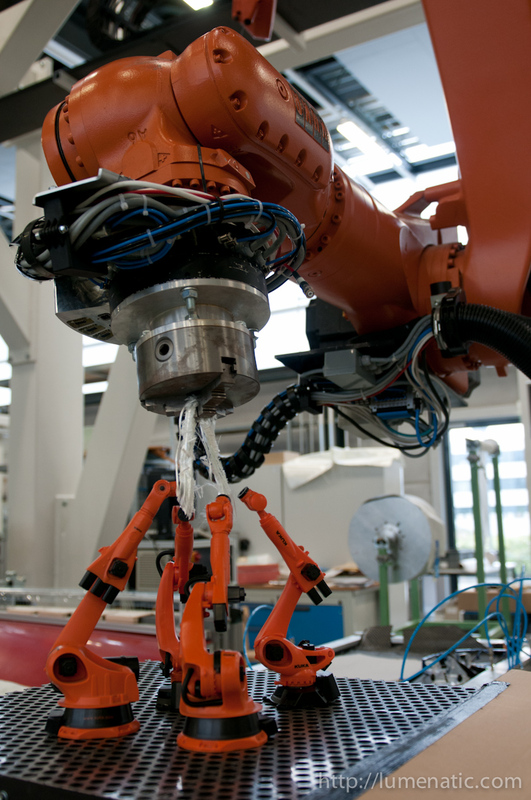 the head can place glass fibres on a moving chain with needles. The glass fibres are wrapped around the needles and the laying head can go to the other side. With multiple heads multiple layers with different fibre orientations can be created. In the image the head applies the second layer at an angle of 45°. 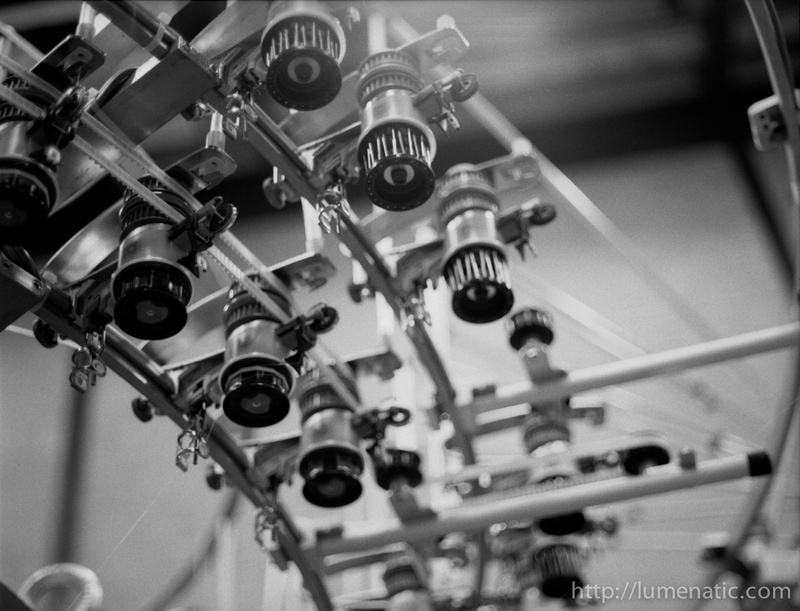 The first layer is oriented 90° (The angle is counted relative to the direction of production. The chains move from left to right in this image). 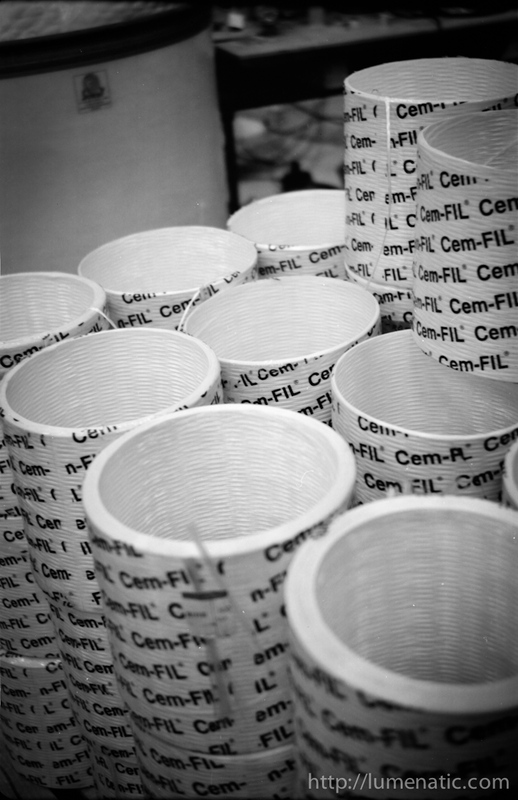 Glass fibre rovings (a roving is a bundle of single glass monofilaments). 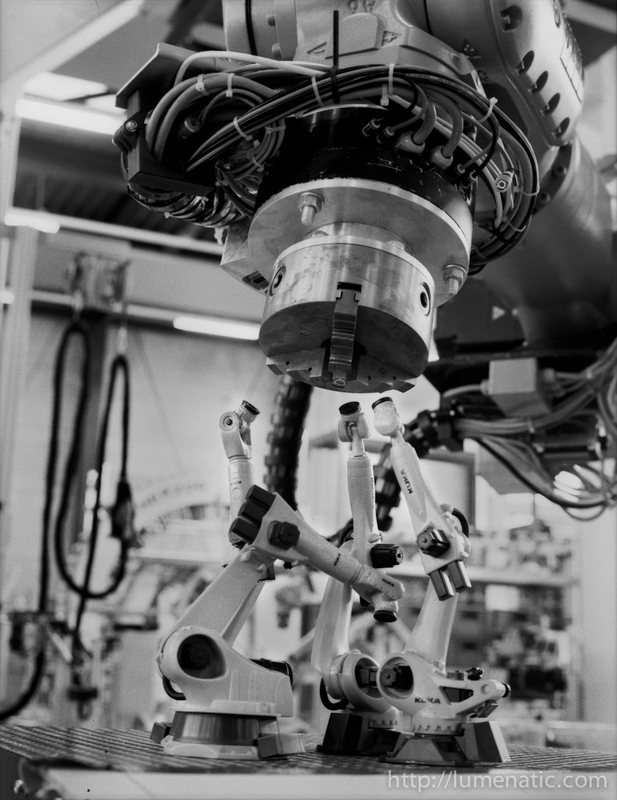 Yet another angle on the robot. The needle locks on a circular knitting machine. 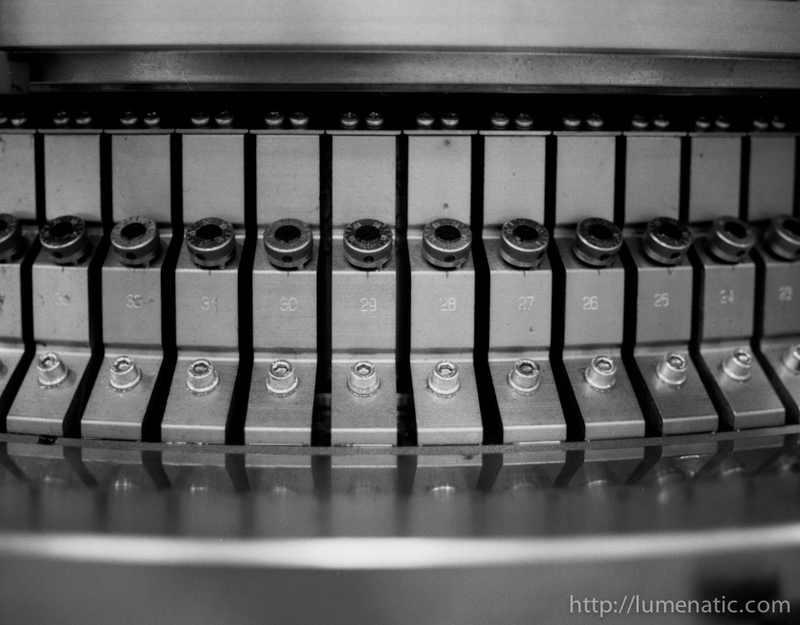 These elements contain channels which guide the movement of the knitting needle. Getting tired of the robot ? 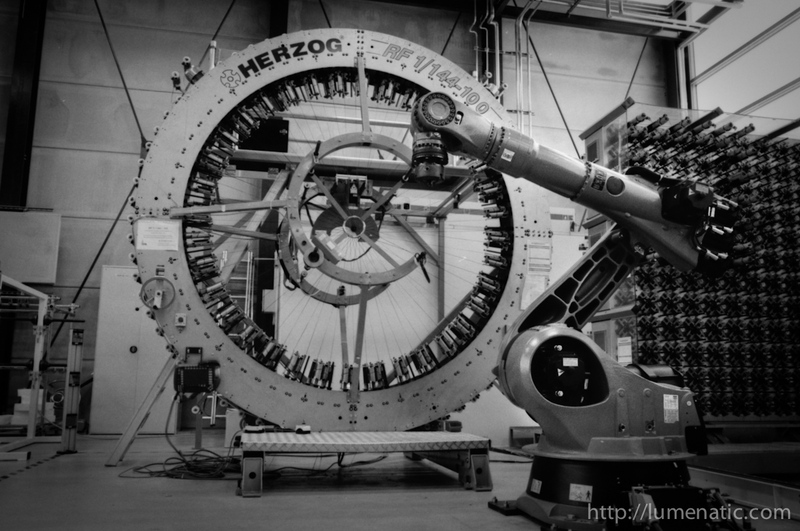 Another robot with a radial braiding machine. 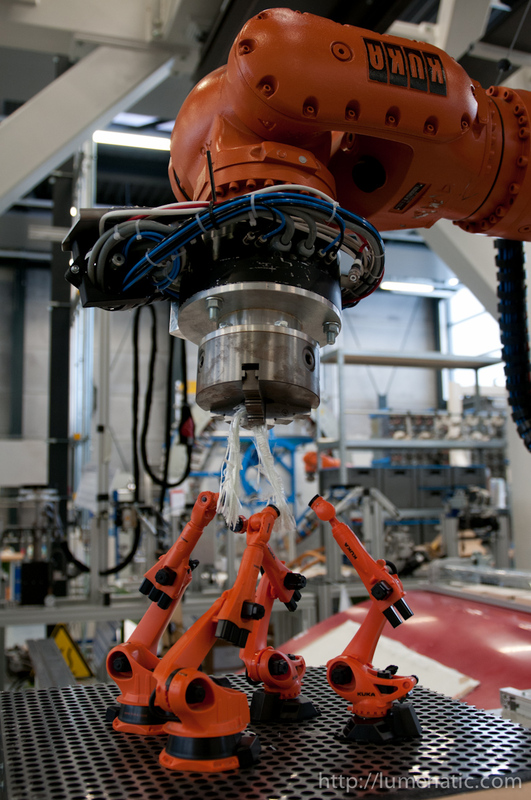 The robot can grab a core and guide it into the braiding machine. A textile can be braided over this core. This way complex geometries of preforms can be realized (again the application area is fibre-reinforced parts). 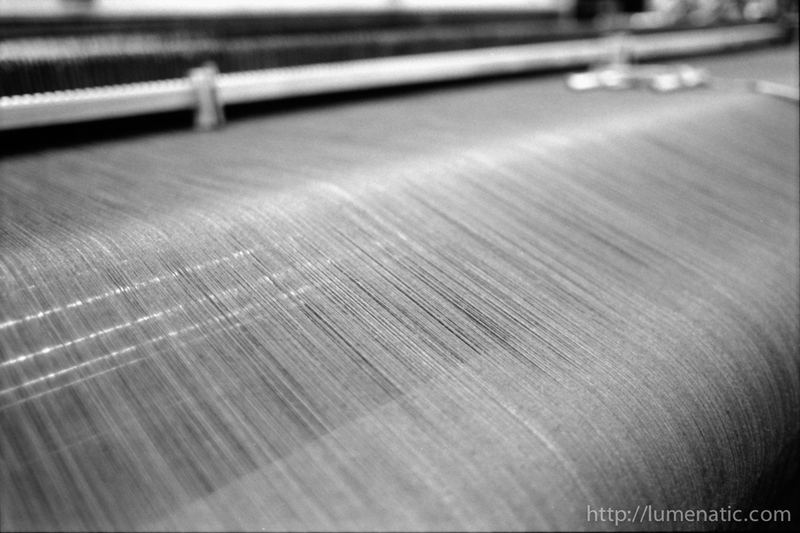 Carbon fibres stringed on a warp knitting machine. 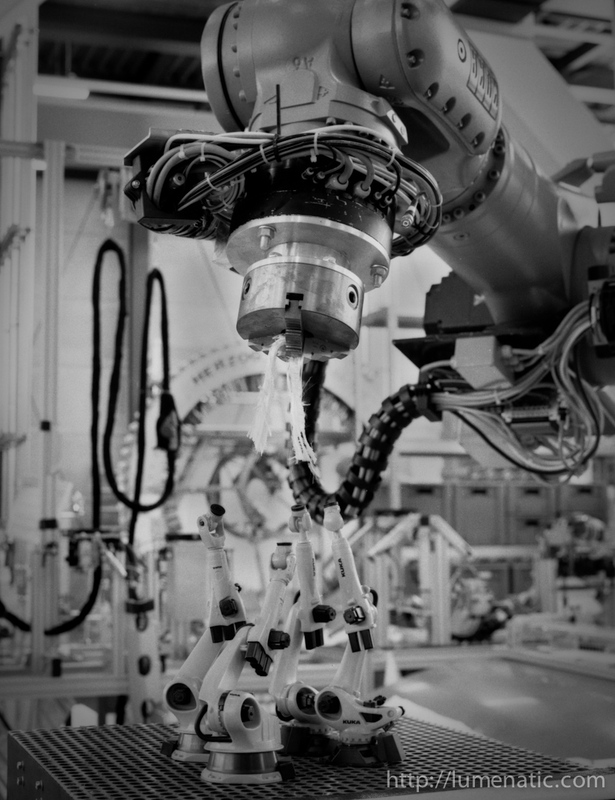 A shot of the backside of a weaving machine. 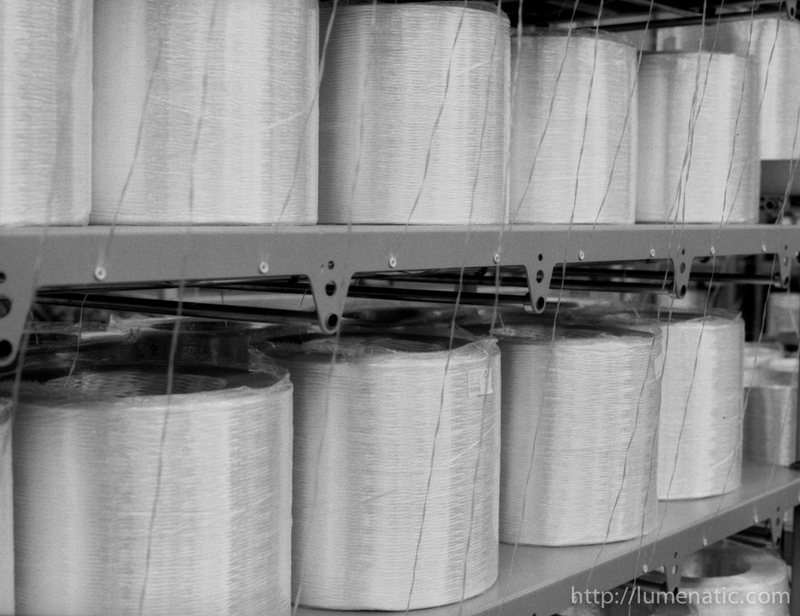 What you see are thin metal sheets called warp thread guardians. 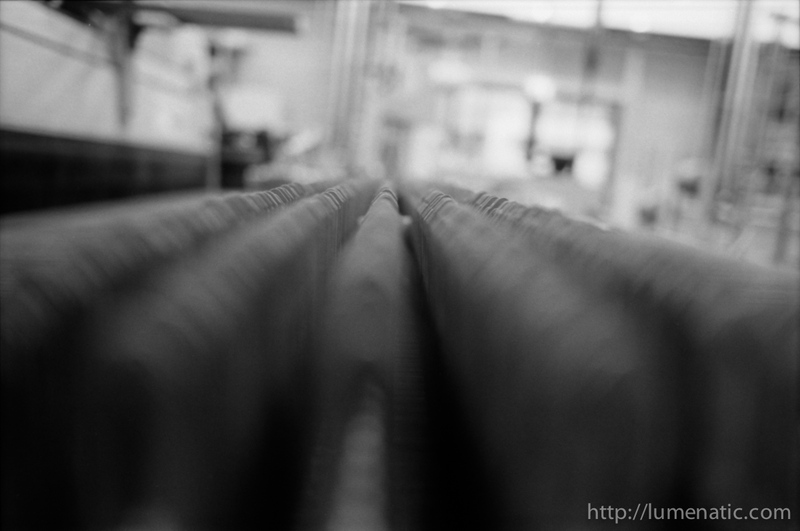 The warp threads (the ones which run in production direction of a weaving machine) are monitored by these metal elements. When a warp thread breaks the metal sheet drops on a rail, creating a short-circuit which stops the machine. 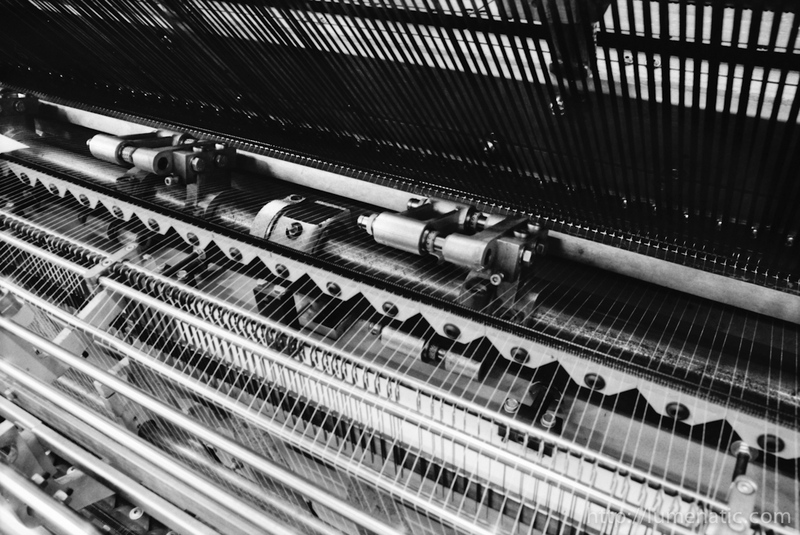 The warp threads of a weaving machine. You can see the rail with the warp thread guardians blurred in the background. 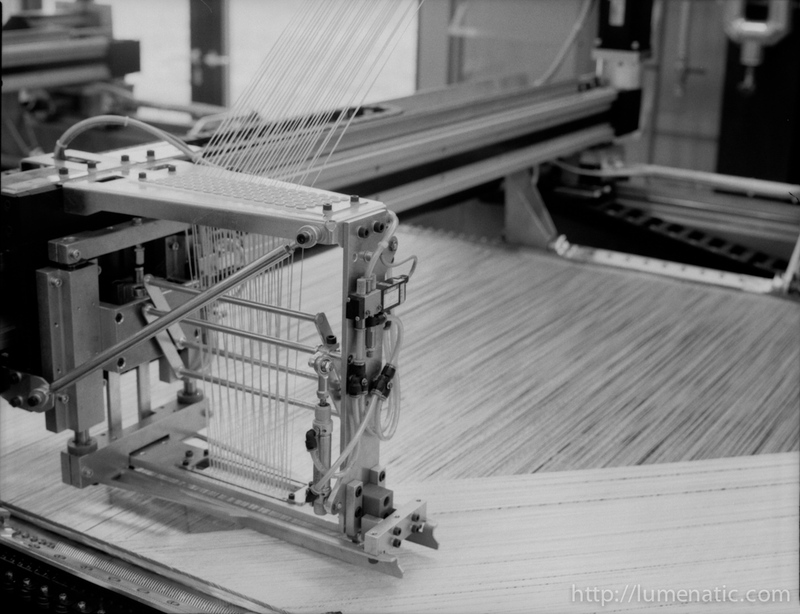 Detail of a warp knitting machine.